Donate Now to support Navy SEAL Chief Gallagher and his family, fighting for Justice! Indefinite Detainment - Chief Gallagher has been in Pre-Trial Confinement after being ripped out of TBI treatment on 9/11 by NCIS agents. He has yet to have his day in court! 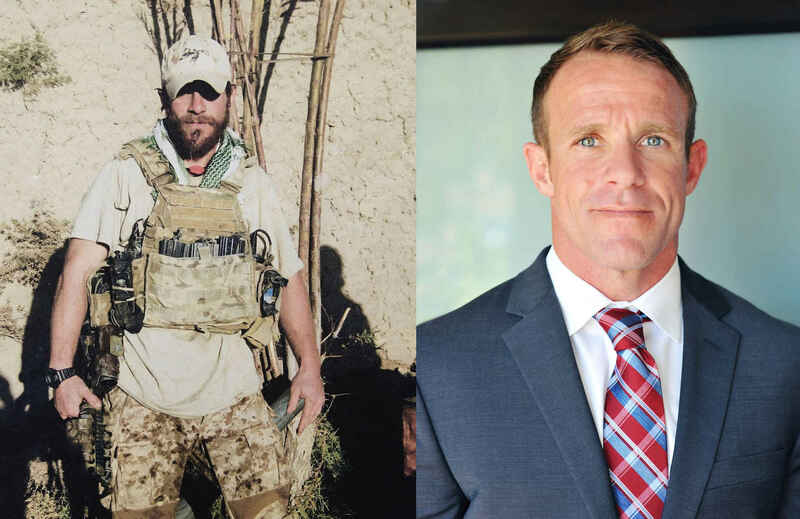 The Navy SEALs Fund – Brotherhood Beyond Battlefield® - is urgently raising funds to assist with the financial impact of US Navy SEAL, SOC Eddie Gallagher's fight for justice! He has been accused of doing his job and taking the fight to the enemy, and now faces charges of mistreating an ISIS fighter. This is no joke, false charges against SOC Gallagher relate to the mistreatment of a terrorist who was involved in a firefight with our troops moments before. Unbelievably, the family home was raided while Chief Gallagher was detained the first time in June by NCIS. Dozens of armed NCIS thugs masquerading as SWAT Police in full combat gear laid siege to the family home, pulling his young children at gunpoint into the street in their underwear while NCIS knew very well that neither parent was at home. That is not what you would expect to happen in America, and yet it did. On Patriots Day, September 11th, 2018, Chief Eddie Gallagher was shackled like a common criminal, taken from in-patient care at NICoE Pendleton, and held in solitary confinement for 72 hours while remaining shackled. He has now been in jail for over months on pre-trial confinement. As he and his legal team prepare an upcoming defense before the United States Navy to fight these absurd charges, Chief Gallagher and his family need your support. As you can see in his bio (at end of page), Chief Eddie Gallagher is a tried and true Warrior. He has earned multiple decorations including three medals for valor in combat. He has sacrificed greatly for the country he loves, ensuring you and your family can sleep peacefully in the warmth of your beds at home. Our organization has supported the fight against these types of erroneous claims in the past and we were able to help our Brothers win exoneration both by raising funds for their legal defense and family support, along with building sheer strength of numbers from the community. It's time to do it again. Join us and give if you can, if not, share our efforts with your network and let's free Chief Eddie Gallagher and clear his name. Help us get Eddie back home to his loving wife and children. The Navy SEALs Fund – Brotherhood Beyond Battlefield® is Honored to be working directly with Chief Eddie Gallagher's family, who has full transparency of this fundraising campaign. Step up in support of a true American Hero who is being wronged by a justice system standing on its head. Fulfilling a lifelong call to serve his country and a sacred family tradition, Chief Eddie Gallagher joined the service soon after high school in 1999 and enlisted in the Navy. He joined the ranks of his father, a West Point graduate and retired Lieutenant Colonel, two naval aviator uncles (one of whom died in the service), and three grandparents who served in World War II. After 19 years in the service and eight combat tours, Eddie is among the most elite of warriors who has served quietly and bravely on the front lines to protect his country in nearly every conflict since 9/11. After boot camp Eddie attended Corpsman (Medic) school, was attached to a Marine Corps unit, and in 2000 first deployed with his Marine platoon to Kosovo. After September 11th, 2001 Eddie saw clearly his call to defend the country and volunteered for Marine sniper school. Eddie become the first non-Marine to graduate the school, an incredibly tough feat for this insular and elite program. As a Marine Scout Sniper, Eddie was among the first waves to deploy on the front lines of Operation Iraqi Freedom in 2003 to Mosul for his second combat deployment. Never settling, Eddie strived to do more and upon returning home he enrolled in Basic Underwater Demolition Schools (BUDS). He graduated in 2005, becoming a United States Navy SEAL. He was again deployed to Iraq in 2006-2007, and in addition to the combat action and Iraqi and Afghanistan service ribbons, Eddie was awarded Navy and Marine Commendation Medal with V for Valor. During 72 patrols and 12 combined direct-action missions, many under direct enemy fire, Eddie's "unrelenting perseverance and loyal devotion to duty" resulted in 36 terrorists captured. As a SEAL Eddie would continue to excel, rising not only in rank but as a true leader. He became lead sniper, lead platoon medic, lead breacher, fire team leader, master training specialist, squad leader and eventually, lead petty officer where he was in charge of entire SEAL platoon deployed to the Middle East. He would be recognized by the Navy for his leadership, given the award of Sailor of the Year and Sailor of the Quarter – titles granted to superior and dedicated professionals within their commands who best represent the Navy. Among his numerous deployments with the SEALS Eddie was again recognized for valor in combat, being twice awarded the Bronze Star with V for Valor. In one instance, under enemy fire yet again and from multiple positions, Eddie cleared nearly 100 stalls in a bazaar in Afghanistan, secured a rooftop position, and effectively freed a friendly element that was pinned down by enemy fire. His "courageous and decisive actions silenced the enemy fire…and "by his extraordinary guidance, zealous initiative and total dedication to duty, Petty Office Gallagher reflected great credit upon himself, and upheld the highest traditions of the United States Naval Service." Eddie has undergone a total of eight tours of duty, six as an elite special forces operator serving on the front lines of combat. He is the consummate and professional warfighter, earning medal after medal for leadership and bravery in battle. In total Eddie has earned the Bronze star with V for Valor twice, Meritorious Unit commendation, Presidential Unit citation two Navy Commendation medals, three Navy and Marine Corps Achievement medals, and four good conduct awards. His last deployment in 2017 to Iraq where he was tasked with leading his platoon to clear ISIS from Mosul, Eddie was awarded #1 SEAL Chief and #1 SEAL platoon. Eddie's record and reputation as an elite warrior is rivaled only by a few men who have served by his side as special warfare operators and heroes who have gone before him. He does not seek recognition for his work, but his service demands the respect and honor owed to the special breed of warrior ready to answer our Nation's call. Thank you for your service, Chief Gallagher. I pray you never give up hope or love for our country. Thank you for your service, you deserve a fighting chance to be free of this and we are so grateful for all you've done to keep us safe and free. Please help to free Eddie. Prayers for his family!! Andrea, from one military family (and sisters in faith) we stand with you and are believing for full and complete redemption. Your faith amazes me. A man that has served for nine tours does not need to be treated this way! We don't have enough Heroes and we can't let this one languish in the brig. Go Eddie! Because I believe in people like Fredie-He is a war Hero not a criminal, and in no way shape or form should he be in prison. I always wanted to be a Navy Seal and was lucky enough to meet a group of Seals running on the beach on Cornodo Island. #ultimate respect. I support freeing this American hero.